September 21 Brookside Bar, 651-433-1112, 140 Judd Street Marine St Croix, MN (2:00-6:00pm) Outdoor Show! Marine Art Fair!! Featuring the Bighorns with Brian “Zoot” Simonds on Sax and Rand Evensen on T-Bone!!! 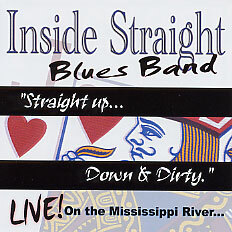 Inside Straight Blues Band has appeared on iTunes European Blues Charts five times since May 2011; “Born in Chicago” at position #95 on May 15, 2011 on the Denmark Blues Chart, “You Don’t Know What Love Is” at position #13 on the February 1, 2012 France Blues Chart, and “Never Make My Move Too Soon” at positions #56 on September 29, 2013 and #56 and #92 on the September 30, 2013 Spain Blues Charts. Kurt Koehler, Band leader and Guitar Player former owner, publisher, and editor of the Twin Cities Blues News monthly in publication from 1996 to 2006 was inducted into the Minnesota Blues Hall of Fame in 2009 for literature. "Live On The Mississippi River" CD!! © 2004-2016 Inside Straight Blues Band, all rights reserved.